(super premium) and Arkhi (premium) vodkas. A standard vodka and a beer brand are planned for future release. Three seasoned industry executives with brand building successes are leading the global effort: Jett Yang, formerly of IDV and Bacardi, is managing director of international business; James Espey, formerly president of UDV, NA and chairman of Chivas/Martell for Seagram, is handling the vodka’a entry into Europe and global duty free; and Arthur Shapiro, formerly executive vice president marketing and strategy for Seagram Americas and, since then, consultant to a number of leading spirits companies, is the senior advisor heading the US effort. In 1924, APU was created as a state-owned company, the country’s first national brand, but today the beverage producer is in private ownership and one of the most technologically advanced producers of bottled water, soft drinks, beer and spirits (vodka represents approx 65% of APU’s sales – 20 million litres in 2012) in Mongolia. It employs over 800 people and has an annual turnover of around US$300m. “The introduction of a portfolio of Mongolian vodkas. I believe represents a turning point in spirits. Just as ‘new world wines’ changed the wine category, we can expect Mongolian Vodkas to do the same for vodka,” says Shapiro. The APU Company is built on the site of the last Emperor's Palace, the Bogd Khan’s Winter Palace located in Ulaanbaatar, the capital of Mongolia. Synonymous in Mongolia with supreme quality and with access to the highest quality ingredi ents, wheat, water and minerals from the vast natural landscape, APU has developed a strong portfolio of national brands and is now poised to launch the its finest grade of vodka, Chinggis Khan Original Mongolian Vodka, internationally. 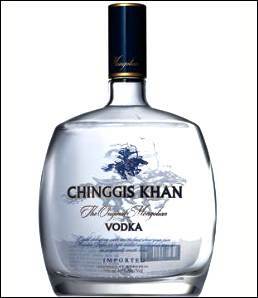 “Chinggis Khan Original Mongolian Vodka draws its high-end luxury status and enduring power from the land. Made with the finest Mongolian wheat from Mongolian Steppes and a six-step distillation with the purest grain spirit, Chinggis Khan Vodka is then filtered using charcoal, quartz, diamonds, black pearls and silver to create one of the very finest examples of vodka in the world. The water used to make Chinggis Khan has melted from the snow on the Sacred Bogd Khan Mountains, which were formed more than 800,000 years ago, and has flowed under the lands across which the nomadic tribes still move, bringing Mongolia's natural spirit to Chinggis Khan Original Mongolian Vodka. Shapiro sees the Mongolian vodka’s main competitors in the US as Grey Goose and Absolut and, as with these leading brands, the packaging and presentation will be of prime importance: “Our proposition involves product excellence with contemporary and stylish packaging,” says Shapiro, “therefore we have involved a number of international design agencies, like Dragon Rouge in France, and we are using a variety of recognized global suppliers for the bottles and closures, like Guala Closures and Saver Glass. “The vodka is also the highest grade of spirit possible (alpha-grade, which is more superior than luxury-grade). By using the finest of ingredients, an uncompromising six-step distillation and filtration process, it has exceptionally smooth taste…and that’s what will attract it to the vodka consumers with a desire to discover new and unique vodka expressions,” concludes Shapiro.